How many diagrams in one file? How many diagrams can there be in one file? Or perhaps a better question is: how big can a Bizagi file be without any problems (when loading, saving etc)? Or should I split models in separate files and link between them? You can have 50 diagrams in one file as maximum. However, only you can have opened 10 diagrams. In order to close diagrams, do right click on the tab and then close. If want to open again, you can go the diagrams (menu option) and search according the name. Finally, click on it. What about attached files etc.? Is there any limitations in file size (or where it will be slow to open). We have no official position or restriction on the size of the files in a model (.bpm), there have been no performance measures regarding this. Ideally, use small attachments such as documents and images, but if too many are used can also affect performance, especially when you save or open frecuently your .bpm file. From what we've seen on models user submitted model files do not exceed 10 MB. is the limitation of 50 diagrams/file same in paid version (Studio)? What if a company need to exceed the number of processes to document them in one file? Coud the company buy Bizagi and have unlimited or higher number of processes in a database/file? Bizagi Modeler does not have limit of diagrams. We have analysed it with our product team. The license that you pay is to remove the company logo. Feel free to add as many diagrams as you need. To improve the performance of the Modeler keep less than 10 diagrams (tabs) opened in a Model. 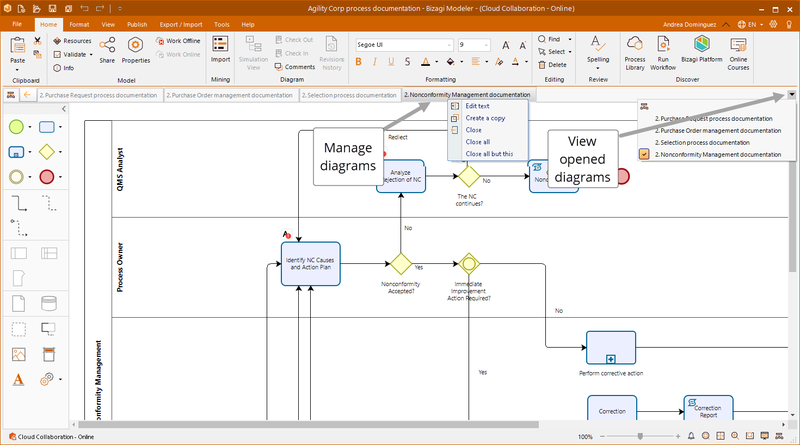 The diagrams opened are displayed at the top, and can be accessed through the small arrows on the right.To close opened diagrams, right-click any of them and select Close, or Close All. This will not erase them from the file, this will only close them. You can delete a diagram by selecting Remove.